Manchester, New Hampshire (CNN) - Rick Perry signaled Saturday he would be open to sending U.S. troops into Mexico to combat drug cartels should the situation arise. After speaking at a house party in Manchester, the Texas governor was asked a series of questions about the border and his stance on illegal immigration. He said the leaders of Mexico and the U.S. should meet after next year's elections to address the deadly drug trade in that country. "It may require our military in Mexico working in concert with them to kill these drug cartels and to keep them off of our border," Perry said. Campaign press secretary Robert Black said Perry wanted to cooperate with the Mexican government and wasn't ruling anything out. "He's going to work with the Mexican government to do what's necessary," Black said. Perry also fielded questions on his stance on illegal immigrants already in the country, and offered a glimpse of the stance he may deploy on the debate circuit. 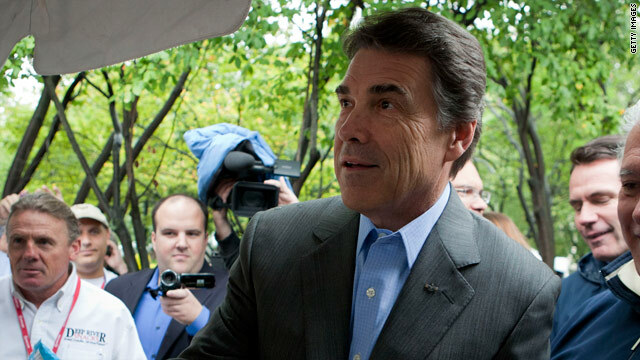 The issue has offered his opponents the chance to wound Perry in previous debates. An audience member at the house party asked Perry about his support for a Texas law that grants in-state college tuition to the children of some illegal immigrants. Perry defended his stance as being widely popular among state legislators and asserted it was a states' rights issue. And he told the audience that - as a border-state governor - he was the only candidate with the experience and "courage" to tackle illegal immigration. "I'm the only one that's been dealing with it for the last 10 years, and I know how to secure that border," he said. He also took a subtle dig at his opponents, who have attacked the Texas governor's conservative bona fides on illegal immigration at a series of debates this fall. "I don't have the privilege to stand on a stage and say, oh here's what I would do," Perry said. "I've been governor of Texas for 10 years. I have to deal with these issues, real-time." NO Perry, you cannot eat your cake and have it all...you forgot that we must reduce the role of Government, cut spending, not believing in science, not believe in climate change, Social security is a punzi scheme and even reduce the role of our brave military. Hey perry!!! You want a small Government? You cannot send our brave soldiers to other sovreign country to fight your war,the government have to be small and thin that's your stand in this situation. We need job and good health care here in the US. This guy is a complete nut case and does not deserve a position in Washington.